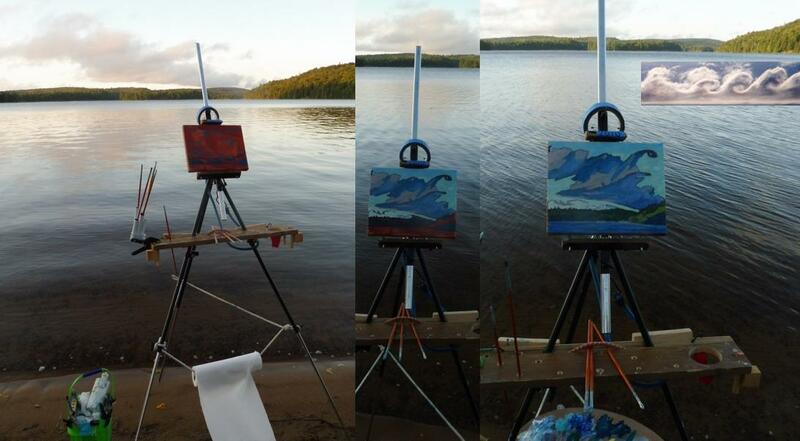 Phil Chadwick's Art: #2010 "Algonquin Rock Lake Sunrise"
#2010 "Algonquin Rock Lake Sunrise"
After completing #2009 "Algonquin Rock Lake Turbulent Sunrise" I selected a view looking more southward across Rock Lake. I liked the shape of the turbulent stratocumulus and the colours of the sunrise sky. Some bright cumulus were billowing upward on the southern horizon. I included the Arctic Sea Smoke on the southern shore of Rock Lake. The shapes of the clouds tell the story of the associated wind. There was some wind shear generating a lot of kelvin helmholtz instability. That wind profile was certainly everywhere over the lake but there was only one small strand of moisture to reveal it. If you imagine tubes of rotating fluid caused by wind increasing with height, the wind shear creates those rotation and the cloud shapes that reveal them. I some ways kelvin helmholtz instability resulting from wind shear looks like a pencil being rolled across a table top. The is also one distinctive curl in the leading edge of the turbulent stratocumulus. The clouds always have a story to tell.